FLIGBY® (abbr. 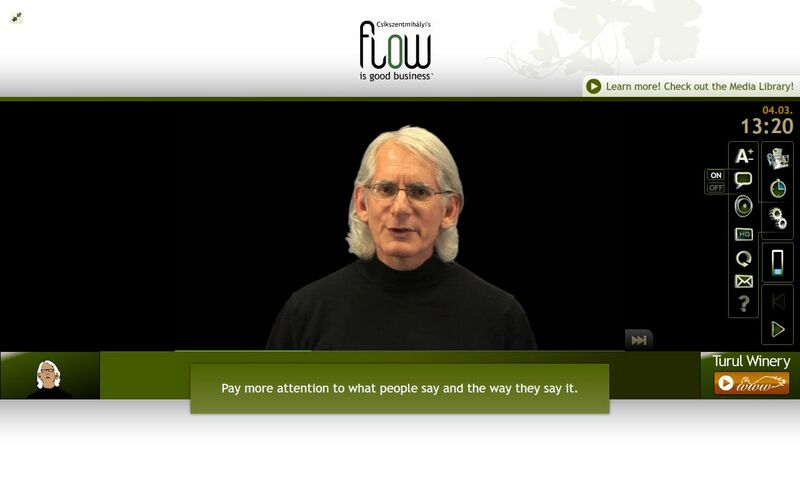 for “FLOW is Good Business for You™”) is the ultimate award-winning online Leadership Development Simulation. This is the official Flow-program for decision-makers by Professor Mihaly Csikszentmihalyi and ALEAS Simulations. FLIGBY’s leadership development program combines video-game learning experience with benchmark-based competence assessment. FLIGBY makes you prove your worth as a leader. In the Game, you become the General Manager (GM) of a fine Californian Vineyard. Your goal is to make “Turul Winery” a high-performing business and a great place to work. With FLIGBY we want to show decision-makers how to foster Flow and use its psychic energy to enhance the happiness of their employees, customers, stakeholders and even themselves. FLIGBY, the official Flow-program is an online, single-user, scenario-based serious game in an interactive movie format. Serious games are digital applications used for purposes other than mere entertainment. FLIGBY has the look and feel of a game, while it is simulating real-world events and processes. In the movie-like virtual reality, each individual game participant is charged with leading a management team comprised of 8 pretty sophisticated individuals. As the Winery’s new GM, you must build a cohesive leadership team, craft a strategy, handle conflict situations, prioritize tasks, and resolve a plethora of day-to-day leadership and management dilemmas. FLIGBY combines the very best of virtual reality gaming experience with cutting edge leadership development. It puts any leader’s skills to the test as he or she advances through a full set of leadership challenges that feel real because the situations encountered are 100% realistic, of the kind that we encounter each and every day at the workplace. In 2012 FLIGBY, the official Flow-program won the Gold Medal at the International Serious Play Awards in the category of Corporate Games. Take your tour and discover four great features of FLIGBY!